As you read, think about how a reporter would describe his or her experience to visit your church for the first time. My visit to upper hillside located Amazing Grace Lutheran Church seemed to have started on the wrong foot as I pushed through a thick knot of unwelcoming members as I entered the narthex. I didn’t realize it was the attenders for the 9:45 service attenders exiting and visiting with each other. Entering the sanctuary, I was warmly greeted by a friendly woman who gave me a hymnal and bulletin. Confused because chairs were being put up, I inquired if I’d missed the service? Because the 11:00 a.m. service has the fewest attendees, chairs are removed creating a closer sense of community amongst those there. An understated sanctuary with lots of wood and warm accents, felt to me as though I was coming home. This may have been due to the Lenten accents of cross draped with purple, rough hewn altar, and tasteful hangings of decorated burlap. 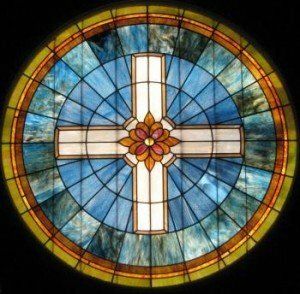 A signature round stained glass window, featuring a cross, highlights the east wall of the sanctuary without intruding on one’s sight lines to vie for attention. I counted twenty worshipers including a signer for deaf attendees, a pleasant first for my visits. During the Passing of the Peace, it seemed as though one-half of the church greeted me. The service was Lutheran liturgy. Pastor Marty Dasler was hands on and extemporaneous in his remarks. The music was simple and heartfelt. The eucharist was delivered to a circle of congregants around the alter from unusual eucharistic vessels. A touching moment concluded the service when Dasler prayed a birthday blessing for a younger member. I’m told their 8:15 and 9:45 services are heavily attended and feature a choir. A return visit is anticipated for this welcoming congregation. To create an inner sense of personal symmetry, I visited Amazing Grace Lutheran Church on March 1, the First Sunday in Lent. This was my only unvisited church of the four participants in the Daybreak ecumenical service yet to be presented that night at St. John United Methodist Church. Previously I’d visited and blogged my visits to the other three, St. John United Methodist, St. Mary Episcopal, and St. Elizabeth Ann Seton. Located on Elmore just off O’Malley, its signage is not readily apparent. The driveway turn is likewise deceptive and must be looked for carefully. But the church is beautifully sited on its property. 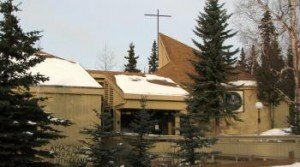 Having had some frustrating experiences with Lutheran Church visits in Anchorage I longed for a totally positive visit to at least one Lutheran Church. Of two previous visits so far, one never made it into print and the other did but with exceptions. To a first time visitor, Pastor Dasler showed both a practical and innately intuitive spiritual side. After the Passing of the Peace he played “Rock, Paper, Scissors” with a parishioner volunteer.The purpose of this exercise was to underscore Lenten discipline and that “…Spirit overcomes flesh.” So simple, so powerful and so memorable. Dasler was extemporaneous in his remarks speaking from his heart, not from transcripts or notes. Psalm 139 was the basis for his sermon. This church has many talented musicians, both instrumental and vocal. I struck up a conversation with the pianist/organist Kathryn Eckmann after the service. I discovered a common bond we shared for the spiritual effect music possesses. One of the songs sung in the service was composed, words and music, by a member pianist/organist Carolyn Nickles. God of pow’r and might. Comes in the name of God. Although not expecting such a small number of attendees, I found size irrelevant. These attendees were clearly focused on worship. 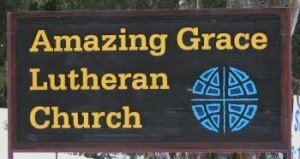 I understand Amazing Grace is having special Lenten Worship Services on Wednesday evenings at 7 p.m. preceeded by a soup supper. The services begin with vespers and are designed to be reflective including a series of Desert Readings featuring quotes by Thomas Merton, selected Desert Fathers and other spiritual leaders. 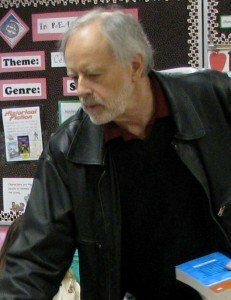 Chris Thompson, an amateur biblical scholar and student of religions, is a member of the American Academy of Religion (AAR) and Society for Biblical Literature(SBL). He enjoys AAR/SBL where he studies, first hand, with worldwide religious scholars. A management consultant, skilled in all aspects of 360-degree feedback programs and human resource management systems, he practices these skills as Workforce Consulting.